There is something about being able to grow your own plants that is so satisfying. Knowing that you can nurture a small life and help it grow into a full, healthy, being is something to truly treasure… Though I wouldn’t know because I can’t grow a sigle thing to save my life! Seriously, you think I’m kidding, but I’m not, I am the girl that can kill succulents. A plant so hearty that you don’t even really have to pay attention to it… and yet, somehow, I am able to send them back into the earth from whence they came. I don’t get it, my mother has a great big thriving garden, complete with a fountain and real live fish, and I can’t grow a succulent in a pot! Lord have mercy the day I decide real living things should enter my life, such as a dog or heaven forbid (for the time being at least) children (I do want them, don’t worry mom, just not now). The problem is, I really love plants, so I keep purchasing their innocent unsuspecting chutes from a little woman down the street and then, several weeks later, burring them deep in the earth, sad and ashamed. I have started foraging branches while out on walks to try and fill the void I feel, but they too die so quickly. What is a girl supposed to do? I need living things surrounding me, they make me happy in the most simple way. Getting desperate I decided I would head back up to the garden shop and buy more plants from the little woman who now looks at me wearily (I think she knows I’m a plant killer). 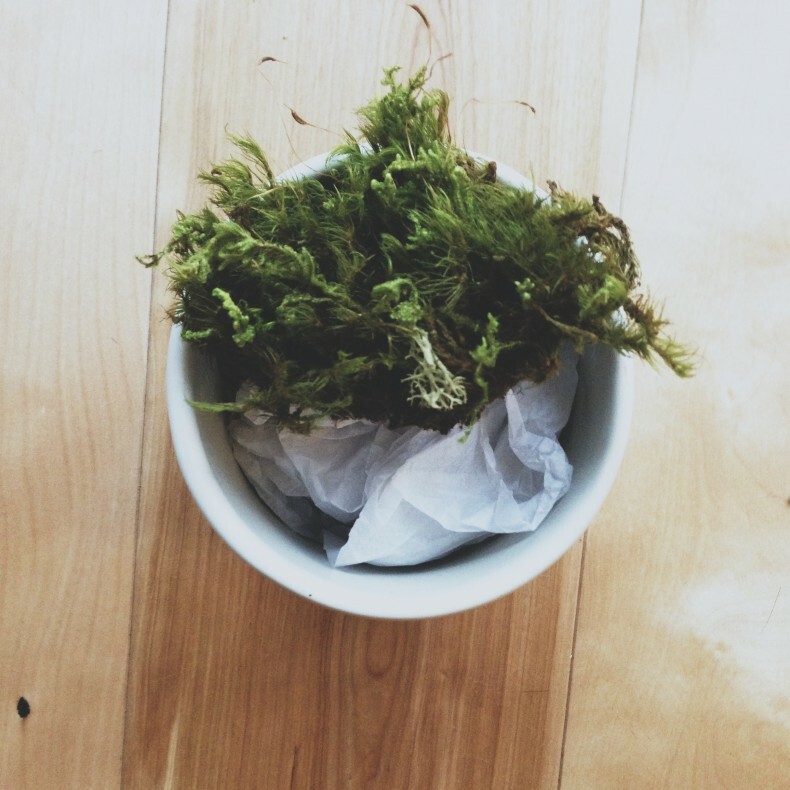 But then, while rummaging through a box of decor (that is still unpacked), I stumbled upon a bag of moss. I was intrigued. Moss is green and plant-y and it is preserved so it can’t really die… it’s like taxidermied plant life that will live forever in a slightly creepy frozen state. It’s brilliant really. Struck by a (rare) stroke of genius, I decided to stuff a little planter (that formerly held an orchid Drew so sweetly bought for me and I unceremoniously managed to kill) with tissue paper and tenderly place the different specimens of moss on top of the tissues crumpled surface. The result was nothing less than ideal. It is green and lush, and best of all, I can’t kill it (well at least I don’t think I can, then again…). If you are also a hopeless cause, a lover of plants and murder alike, I highly recommend this form of plant life. It is far more real than fake flowers (come now, we mustn’t stoop that low) and let’s face it, moss is pretty damn trendy. So go, buy some freshly preserved, dyed, spongy specimens, resurrect a pretty planter and build your own little pot of cheer.